I love your table! I did a small one too this week. I want to sit awhile and have a cookie with you! Love the Thyme in a Jar! You are right, there is something about a tablecloth - and a plate makes cookies better! I am a Lines from Linderhof fan and am always warmed and cheered by your posts. Must tell you, I made the Ina Garten Crunchy Noodle Salad (inspired by you) to take to a Baby Shower Luncheon and got raves! Your posts are great and always inspire. This is beautiful. I love the cloth. I'd love to sit there and have tea!! I love the WS outler..I am using my tablecloth from there for next week's TTH...have to think it out! Save me some tea, we are still in the hot choc mode here! 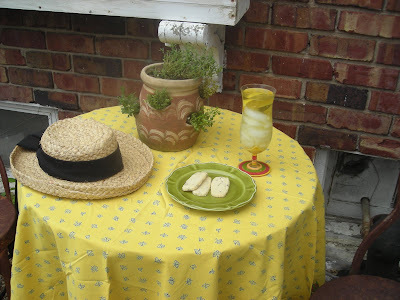 The perfect spot for a drink and cookie, your tablecloth is so pretty with your herb pot and straw hat. happy TT, Kathy. I love that hat! Lavender cookies, yum! Your table is very sweet and the tea looks delicious too. It's lovely. That tablecloth is great! I Love Your Tablescape Too!!! !And I love the chairs! That hat,tablecloth, and COLD DRINK! Beautifully simple - sometimes we just need to treat ourselves well. Your tablecloth is lovely - so bright, and the thyme jar is fresh and alive. What a lovely spot to "take a break". I love your tablecloth, and the cute hat! ummmmm! I bet the lavendar and thyme smell wonderful. Pretty little spot. Gardening used to be my favorite hobby(I used to have a home, now I live in an apartment. ); I'd spend all day putzing in the yard, mulching, edging, etc...I was a perfectionist. I might work eight hours or so and then come in all sweaty and bushed. Why am I telling you this? 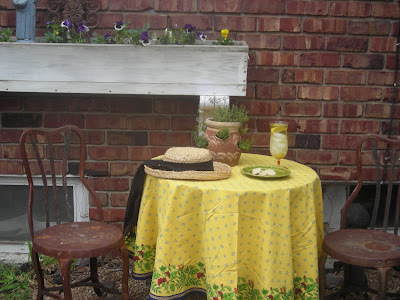 Because when I would be sweaty and bushed, I would have LOVED to come and sit a spell at your table, have a cool, refreshing glass of green tea and some wonderful lavendar cookies and sit and look out over the pretty yard. The tablecloth is oh, so pretty and fresh! Your beautiful tablescape brought back that feeling of working in the yard-such wonderful memories of my favorite hobby. Thank you for that. Your tablescape was just wonderful. Just wonderful. I wish I could join you. Your tablescpae looks so... inviting. I love your tablecloth. The thyme in the pot is awesome. What a beautiful, simple table in a wonderful setting. I really like the yellow and green. Can I have a cookie? Have a great day! What a beautiful spot of sunshine! That tablecloth just brings spring right into your patio!! So pretty! Thyme in a jar--I love it! I am itching to get my hands dirty as well. Hope you'll share the cookie recipe soon! Your table looked just perfect for taking a rest from the garden! The glass of tea looks refreshing..
Just love your tablescape! You could have told me you were in the Italian countryside and I would have believed you. Best of luck with your class this evening! I know you'll do a great job! A scene right out of a movie or magazine. 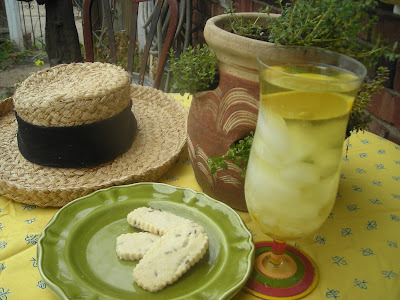 Love the hat and the ice tea; with the lemon. Simple but makes a statement. Beautifully simple. Perfect, really. I can imagine the pleasure at sitting down here after a good session in the garden. Simple & relaxing & inviting. Thyme in a jar is a good idea! 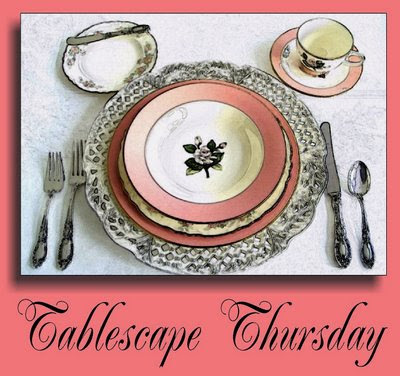 Thank you so much for stopping by and taking a peek at my "Brume de Rose" tablescape and for your kind comments! What a lovely table in an outdoor setting! I love your little table and chairs and that sunny yellow tablecloth is gorgeous! Mmmm...lavender cookies, maybe some day you could share your recipe with us? Well my friend, don't work too hard and have a wonderful day! What a lovely setting, Martha! I love the yellow tablecloth. I am so envious of your pansies in the window box and your jar of thyme. We don't even have pansies at the garden centers yet! I'm new to your blog. I have enjoyed my visit. The sunny yellow tablecloth is just right! What a great place to relax and have a cold iced tea or lemonade! LOVELY setting in your garden! 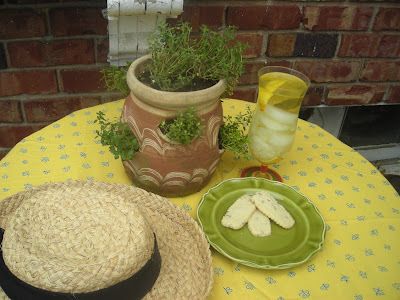 I love every little bit of your tablescape: fresh cookies, fresh tablecloth, live plant, cute hat! I think I have a hat like that too. Oh Martha, how charming this little setting is! It makes me want to sit right there, eat one of those cookies and take a time out! Thanks so much for visiting my blog today. I am having so much fun with this tablescaping! Getting your hands dirty in the garden is therapeutic. I have 2 kinds of thyme growing in my herb garden. I love the tablecloth, very pretty. Great idea of the Thyme jar! Makes me think I could use that type of jar for many other herbs too. Beautiful table decor! How fun. Beautiful photography! I want to sit at your table & take a rest as well. Great job!!! What a lovely garden spot! This is such a charming post. I love it! I just want to join you for a lavender cookie and a long cold drink! Love that tablecloth, too. Gorgeous. You grow lavender? I would love to grow some. . . I may be asking your advice! Thanks for a lovely tablescape vignette. Simply perfect! What a wonderful spot to sit and relax. LOVE that yellow tablecloth, and your mother's strawberry jar. Beautiful!